AT 62, many workers would be happy to retire and spend time with their families. Not cashier Alice Teh. 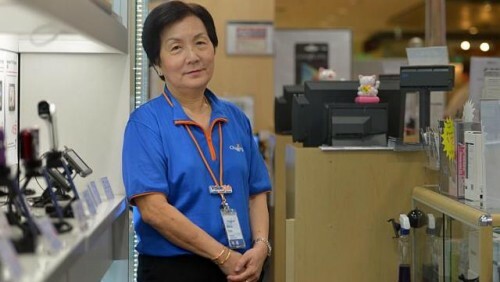 For the past seven years, she has been working at different stores run by IT retailer Challenger. Since earlier this year, she has been stationed at the outlet in the Plaza Singapura mall in Orchard Road. "I like working. My boss treats me well and my colleagues are caring. Importantly, I am financially independent," said the grandmother of two. She has three children and her husband is a taxi driver. Madam Teh earns about $1,900 a month. Challenger did not cut her pay after re-employing her when she turned 62 earlier this year. She also gets the same medical and leave benefits as the other staff. The company subsidises up to 70 per cent of its staff's outpatient medical bills. Junior-level employees like Madam Teh get seven days of annual leave. Challenger's senior human resource manager, Mr William Ng, said the company does not cut the pay of older workers, as they are valued. "The medical bills of older workers cost more than those of younger workers. But we find that their attitude is good and they are more willing to learn than younger workers," he said. Eight of the company's 500 staff are above 62 years old. The company also does not have a retirement age: Workers who perform well can work for as long as they want. That is good news for Madam Teh. She said in Mandarin: "I want to work for as long as I can. I can't imagine staying at home. By working, I have money to go on holidays with my husband."